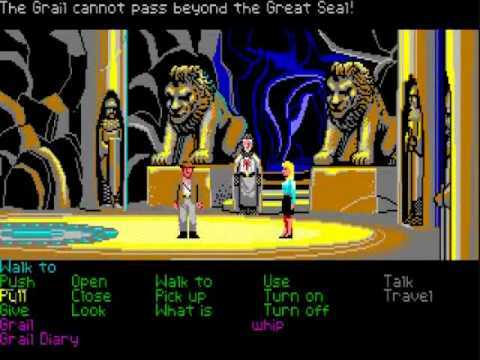 I’ve got a maybe odd question: Can someone tell me the name of the font used in the dialogue and verb-list/inventory of Indiana Jones and the last crusade adventure and the verb-list/inventory of The Secret of Monkey Island (disk version)? This font is not the typical C64 font used in a lot of SCUMM games and was only used in these two adventures. Can anybody help? They are bitmap fonts made by Lucasfilm for the games. I assume you would like to have them as a TTF/OTF font? Hmm sorry, but these links only shows the mentioned “C64 like” font, used for example in Loom, Monkey 1 and 2 (and other SCUMM games) for dialogues. But I am looking for the font used in Indy3 and the verb list and inventory of Monkey Island 1. Using scummfont.exe you can convert the fonts (98.LFL and 99.LFL) to BMPs. The latter one is the font you are looking for. You’d then have to extract the characters and make your own font file. Can someone tell me the name of the font used in the dialogue and verb-list/inventory of Indiana Jones and the last crusade adventure and the verb-list/inventory of The Secret of Monkey Island (disk version)? I don’t know the name of that font and I’m not even sure if it has a name, but your question seems to me a good one to ask on the “Font identification” section of the Dafont forum. That’s why I asked, if he needs a TTF font. Is there a good bitmap to TrueType converter out there? It’s not that I really NEED it. But lately I saw the exakt same font being used on a “DSA” display of the “Deutsche Bahn” and was wondering that therefor it has to be an official font as it was used in the old Lucasfilm games AND is used by Deutsche Bahn. So it’s more a question by interest than anything else. No, the fonts are different: Compare for example the “r” and the “d”. These displays should be using bitmap fonts too. So it’s unlikely that they use the exact same font. Yep, it’s a different font. As others have said, it was a custom font. We created a font editor and made our own fonts in our own format. The upside down font used in the circus in MI 1 was a whole new font. It was a lot of work for a single gag. Did you make a full set of letters, just in case, or only the ones needed for the gag? Did everyone pitch letters in, or was there an art person who did the custom typeography? Seeing that there have been localized versions in different languages, they might have created a full set, I guess. The upside down font used in the circus in MI 1 was a whole new font. It was a lot of work for a single gag. Which is greatly appreciated to this very day by everyone I am telling they should play MI in classic mode (no voice) instead of the Special Edition ! Aww, no love for the ScummVM version that combines classic looks with voice? I first played the original DOS version, of course, but with the special edition I was just switching back and forth all the time, at least once per room. Do most people stick with one display mode? Luckily for MI2-SE, the voice remains in classic graphics mode. I guess, all letters. The game was translated in several languages, and an incomplete font would be a no go for the translators. On the other hand, why didn’t they just code a 180 degree printing routine?